That's really it. Sure, you can design a couple of powers (to gain +1s on various rolls) but the core rules can be explained to new players in one sentence. When was the last time you said that about a roleplaying game? But how does it play? Well...I won't lie, having run four games with the system, I can safely say it is very rules lite and narration heavy. Which means those of you who prefer the crunch of Mutants and Masterminds might shrug it off. But those of you who want to HULK SMASH as quickly as possible should give this freebie a try. Knockspell #1. Mythmere Games. 1st Edition Retroclones. 61 pages. $5.00. 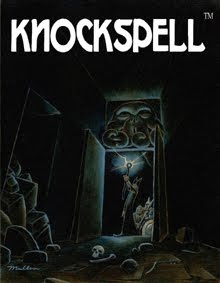 Knockspell is rather renowned in OSR circles for providing a lot of good content for 1st Edition retroclones, especially OSRIC and Swords & Wizardry, and this, its first issue, was released at the start of 2009. I like retroclones more than the next guy (unless the next guy happens to be James Raggi) so I went in very excited. I mean, how could I not be? 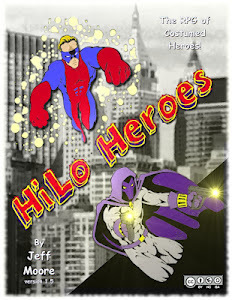 There's a cover from Pete Mullen staring me in the face, promising great adventure and terrible death! And for the most part, Knockspell #1 delivers. True, we get a few tired old editorials (really? In this day of instant blogging there still need to be opinion columns in a gaming magazine?) and a one page advertisement article (for Ruins and Ronin) but there's also a host of good content, including a delightfully evil necromancer class for OSRIC and a monk and paladin for S&W. We also get an adventure for the (as yet) still unreleased Astonishing Swordsmen and Sorcerers RPG that's compatible with your retroclone of choice. It's nice and could be worth running (especially with some adaptions for the new Dungeon Crawl Classics RPG). The other sandbox adventure, Isles of an Emerald Sea, has a lot of really good potential hampered by weak writing and unfinished monster stat blocks. With some elbow grease it might be fun, but it ought to be considered severely unpolished. And to round the whole package out there are a handful of variant rules, a couple of random tables (my favorite being the How Do You Open This Thing? table, dictating the methods for opening challenging doors or the like), a new character class (the Thrall) and part of Michael Curtis' masterful Dungeon Alphabet. Is it worth five bucks? Yes, I think so. The character classes are great and the Charnel Crypt adventure looks to be fun. It's only a shame that some of the content feels so unpolished, especially after all the work that clearly went into the magazine (art and editing). Adventurers Wanted Volume 1. Skortched Urf' Studios. d20 systems. 7 pages. $0.75. This is not an adventure. I say that because I can see how easy it is to be fooled. I mean, it's a product called Adventurers Wanted, there must be an adventure, right? Not quite. It's actually an adventure seed. 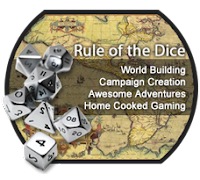 A brief outline of a possible d20 side quest. It's about three paragraphs in length and has suggestions for three different tiers of play (low level, mid range, and high) that dictate the recommended reward and enemies. The basic plot is that a noble lady has disappeared and needs finding. Simple and to the point. 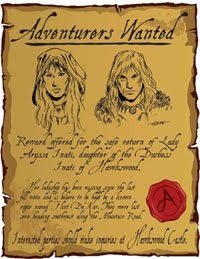 The real selling point are the three Heroes Wanted posters, one in Common (English), one in an Elvish script, and the third written in Dwarven runes. They look good and make for great handouts. This is a fine product at a great price if your players happen to wrap up their main quest a little early and you find yourself at a loss on what should happen next. Just remember that it'll take a bit of work to make this seed a real adventure. Another week down, and another three digital products from my collection reviewed. As always, suggestions and comments go below. Until next week, roll those d20s, gamers.